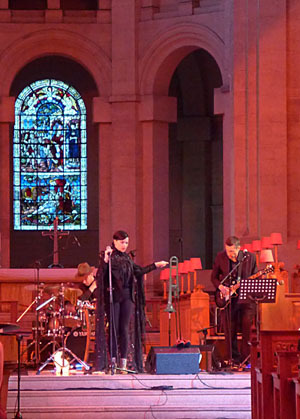 High Church goes well with Camille O’Sullivan. The grand scale, the lofty feelings and all that ceremony. She flutters from chancel to nave in a glittering, bat-winged cape, searching out the exceptional ends of the human condition. But chiefly she’s after the sad stuff. It’s about the poise versus the pain. Fitting then, that this is the first night of the Cathedral Quarter Arts Festival in the very building that centres the area. It’s the city’s best week and let’s hope that the sixteenth year of all this will continue to resist the killjoys, the austerity thugs and the dour faces of kulturkreig that hang from every lamppost. In this mean, threatening climate, the cathedral feels like an actual refuge. And there’s Camille singing the Nick Cave song, ‘God Is In The House’. Such a resounding tune. And while it comes over as a steady old hymnal, it’s actually a satire on small town piety. Can you hear us, Belfast? Camille sings it slow and resists the overkill. It’s astonishing. I’ve not heard anything subversive like this since John Grant bleated ‘JC Hates Faggots’ in Central Presbyterian, Austin, TX. It engages your mind and your heart and you commit once again to CQAF and the momentous reveals that it brings. Camille makes a decent job out of Arcade Fire’s ‘Wake Up’, fetching out the fatalism and dread. There’s a nod to Radiohead with ‘True Love Waits’ and the phantom of Jacques Brel is there for the decay of ‘Amsterdam’ and the annihilation of ‘Ne Me Quitte Pas’. She tells a story well, changing into the red shoes and wearing a poet’s ribbon like Patti. The hands twitch and emote. There’s some levity with a tune from the Kirsty McColl songbook, ‘In These Shoes’, but a less successful version of ‘Hurt’ that doesn’t get close to Johnny’s broken glory. Likewise with a shouty attempt at Don’t Think Twice’ that fights with the cathedral acoustics and misses. Still, the festival is on, expectations are roused and art is in the house. Bless.